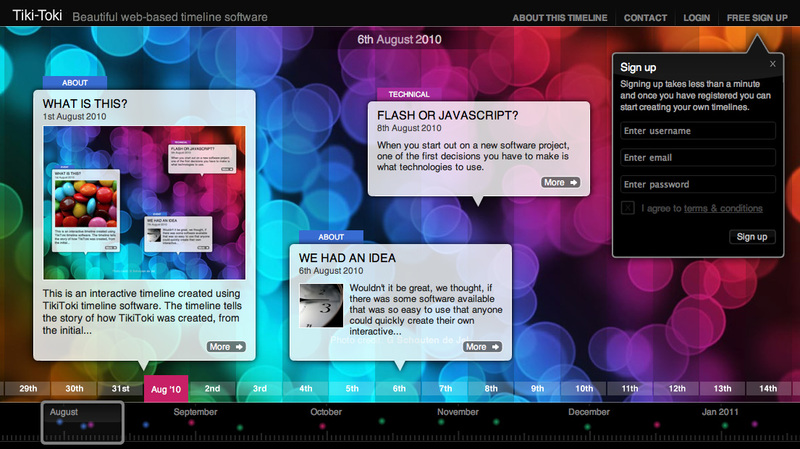 Web apps are helping storytelling evolve. Just look at how Storify is letting journalists pull together disparate snippets of social media into a coherent tale, while Memolane makes it easy for anyone to browse the photos, videos and status updates that they’ve shared online. Now a new tool called Tiki-Toki has launched from a UK-based team, allowing users to build good-looking timelines that tell multimedia stories. Journalists and teachers will find this particularly useful, but anyone who wants to build a timeline to visualise a series of events should give it a go. It’s important to note that unlike Memolane, Tiki-Toki isn’t automated – you have to do the work of manually inputting events on your timeline, although given the far wider range of uses Tiki-Toki has, that’s understandable. Offering a date range of 9999BC through to 9999AD (if you want to predict the far, far, future), you can add text, photos or videos at any point. Flickr integration makes picking photos stored there particularly easy, while YouTube and Vimeo embedding is supported. Despite its gorgeous appearance, Tiki-Toki’s interface is a little frustrating at times. It’s the little things – like not starring out your password as you log in (really!) and the occasionally sluggish response times (even using Chrome 10) that annoy from time to time as you work with it. That said, those kinks can be worked out, and the results of using Tiki-Toki can be incredibly satisfying. Just look at this example timeline tracing ‘The Fight for Democracy in the Middle East’ for example, or this one representing the life of Mary Kearns to see the quality of what can be produced. Free accounts let you create one timeline, while premium accounts are available at prices starting at $5 per month, allowing you crate more timelines and embed them into your own website. A bespoke service allowing you to install Tiki-Toki onto your own server is also available. Details of premium accounts are currently only available once you;ve created a free account – something that probably needs fixing. An introductory video wouldn’t go amiss too. Still, it’s early days for Tiki-Toki and it’s already looking like a highly useful tool with plenty of promise for the future. Tiki-Toki is available to try here.